Modified Bitumen (MB) Torch Down Roofing membranes were first developed in Europe in the mid-1960s, introduced in the U.S. in the late 1970s, and first manufactured in the U.S. in 1980. The membrane is composed of various types of modifiers, reinforcements, and surface treatments. The 36 inch-wide membrane comes with or without embedded ceramic granules that protect against harmful UV rays. The unprotected MB membrane needs an asphalt-aluminum coating, known as Silver Coating, for harmful UV protection. Torch down roofing using MB installs as a single ply, or a two-ply membrane, on both commercial and residential buildings. When installed as a two-ply system, we provide a 40-year warranty. The 2 Ply MB Torch Down Roofing Membrane is 3/8″ thick and can be installed directly over an uneven stone surface without being compromised by punctures. In fact, the stone trapped between the membrane and the old roof provides excellent insulation. It is possible and feasible to install MB over EPDM and TPO roofing systems that have degraded due to the lack of UV protection and the failures of bonding adhesives on seams. 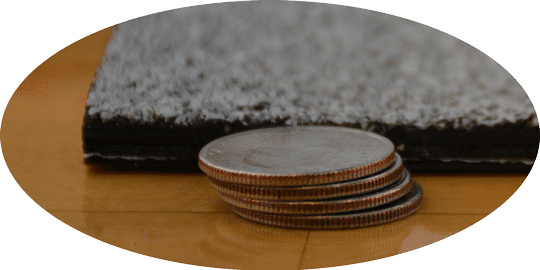 Because these existing roofing systems can be covered with the 2 Ply MB, stripping and removing the current roof debris will not be an expense. 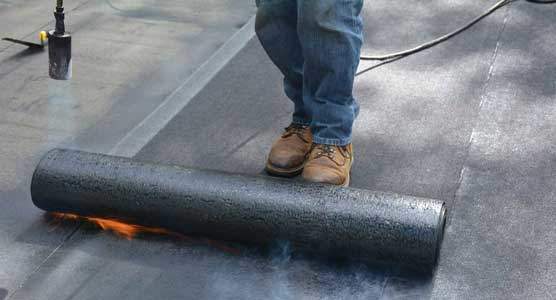 Torching down a Modified Bitumen2 ply membrane requires little surface preparation. A 2 ply torch down membrane can be installed over any existing roof or surface, to include a Hot-Tar-and-Gravel roof system. The first step is to install a fiber asphalt base fastened with anchors and washer plates, to the existing roof, or to a substrate. The second is installing a self-adhering modified bitumen rubber base. 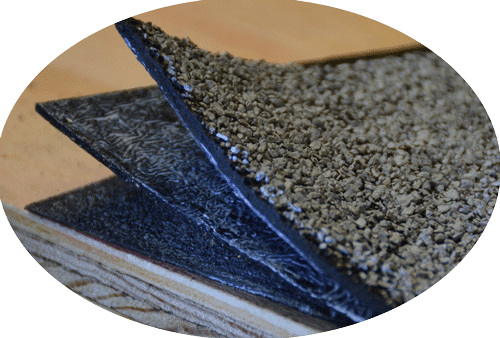 The third step is installing a Modified Bitumen membrane, embedded with ceramic granules, is heat fused down to the base, completing the two-ply system. The combination of these layers makes the membrane over 3/8″ thick. This roof system can withstand heavy foot traffic by work crews, snow shoveling, and because it has embedded ceramic granules on the surface, will protect it from harmful UV rays. MB Two-Ply Rubber Membrane with Fiber Base Sheet. Torch down two-ply rubber roofs are durable in that, not only can they withstand at least 40 years of extreme weather conditions, they can remain unaffected with heavy foot traffic by service and repairers, as well. Unlike the single ply roofing systems, as in TPO and EPDM, the two-ply MB system will need little to no maintenance during its life. I was born in South Africa and moved to the US in 1986. I started Flat Roof Doctor in the '90s. I have Three boys and two girls. I am a Born Again Christian and love to help people. When you come across grammar and spelling errors, please forgive me. I am the site content creator, videomaker and photographer.